Where I found this lovely photo. As soon as I knew I was moving to Wilmington, I found the calendar of a local running group and picked out a bunch of races that I wanted to run. Once I got here I remembered that races cost money and I am a poor graduate student, so I narrowed the field down to one - the Battleship Half Marathon, on November 6th. I've been training pretty consistently for this goal, averaging three runs a week, incorporating speed work, and forming a mini-running group that meets once a week for trips around the four mile loop at Greenfield Lake. A week ago, I fell during what should have been an easy six miler. I rested my knee for a few days and kept it to short and easy runs. On Thursday I ran a glorious five miler, with an average pace of 8:50. (Speed work! It really makes a difference! Who would have guessed!) and then yesterday, I set out for 11 miles. It was a bad run before I even started. Mentally, I was just not in the game. I didn't feel like running, I hadn't slept well the night before, and my motivation was zapped. "Chrissy," I told myself. "This is precisely the best time to run. It's easy to train when the weather's nice and you're feeling great. Anyone can do that. Days like this, however, are the days that count. These are the moments that separate the Runners from the People Who, On Occasion, Run." I knew I was right (I'm always right) and so off I went. While I ran, I began crafting a great blog post about motivation and how training your mind is just as important as your body. The crux of this post was going to be the 11 miles that I finished, despite every fiber of my being asking me to go home and lay on the couch with a tub of hummus and the latest season of Glee. (Sometimes the thought of a good blog post is also highly motivating.) All was going according to plan when, at mile four, my knee started to hurt. And not the knee I fell on - the other knee. I tried to ignore the pain and that worked for a while. But then I took a break to stretch my knee and when I started running again - major pain. I realized, blog post be damned, it's never worth it to risk your knees. This is, of course, the hardest part about running. No matter how much you schedule, train and craft the ideal race schedule, something can happen at the last minute and throw all your carefully laid plans out the window. A wonky knee, an IT band, a fall on the pavement, a thunderstorm on the morning of the race, a sinus infection, a poor night's sleep. 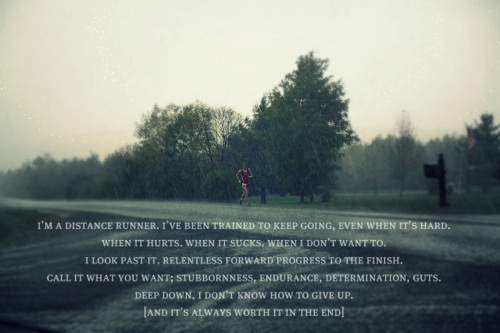 There's so much uncertainty in running. I try to think it as a metaphor for life and view of running as a way to help prepare us for the tragedies, big and small, that we experience every day. Which is helpful, sometimes. Mostly when my knee isn't bothering me.